2012 (August-October), Director (Interim) Research School of Earth Sciences. 2010-2014, Associate Director, RSES, Head of Earth Chemistry Area. Awards Nomination Committee, Geochemical Society 2014-2017. Chair Awards nomination committee 2015-2016. Goldschmidt Conference early Earth Earth theme leader, 2016. Convener of numerous AGU and Goldschmidt sessions. Dorothy Hill Award Committee of the Australian Academy of Sciences 2013-2016. Secretary of the Volcanology, Geochemistry and Petrology Section of the American Geophysical Union 2013-2015. Kuno Award Committee, American Geophysical Union 2010-2012. Goldschmidt medal committee of the Geochemical Society 2009-2011, Chair 2011. Board of Directors of the Geochemical Society 2008-2012. Member, working party to draft Australian Decadal Plan for Space Science 2007. Student presentation judge, AGU Dec. 2006, 2010, 2013. Chair of Drafting committee-Planetary Network Proposal, Sept. 2003. Hon. Secretary Geological Society of Australia-ACT Division 2003-2004. Nominations committee, Geochemical Society 2003-2006. Chair, 2006. My activities are focussed on the application of mass spectrometry and radiogenic and stable isotope geochemistry to solving key questions in Earth Sciences. These include: What was the origin and evolution of the Earth's continental crust? How and when did the various mantle chemical reservoirs form and evolve? How did early terrestrial and planetary differentiation processes operate? How did the Earth become habitable and what are the feedbacks between geosphere-biosphere evolution? Answering these questions entails integrating geologic observations with a range of isotopic investigations including from the long –lived 87Rb-87Sr, 147Sm-142Nd, 187Re-187Os and 176Lu-176Hf isotopic systems as well as from extinct nuclide signatures, e.g., 146Sm-142Nd preserved in Earth’s oldest (>3,6000 million years old) terrestrial materials (Figure 1). These isotopic systems record processes that predate the rocks, providing direct information on the earliest history of the Earth and direct comparison a with lunar and meteoritic records. My research currently includes a wide range of collaborators including Allen Nutman at University of Wollongong and at RSES our laboratory manager Sonja Zink, Marc Norman, Yuri Amelin, Trevor Ireland, Mark Kendrick, postdoctoral fellow Janaina Avila, PhD students Pat Carr, Thomas Haber, Jennifer Prichard, Laure Gauthiez Putallaz and Joelle d'Andres – Ducommun, as well as various international collaborators. My group’s main research tools are our thermal ionisation mass spectrometers (Triton and MAT 261) and isotopic clean laboratory facilities (Figure 2) as well as the three large ion probes -SHRIMPs and plasma source mass spectrometers housed within RSES. In addition to research projects aimed at revealing the first billion years of planetary history, my other current research includes on-going investigations to determine the impact history of the Moon through geochemical and isotopic studies of impact melt rocks collected during the Apollo missions (PhD student Thomas Haber); the origins, tectonic history and age of the mantle lithosphere underpinning the South Pacific micro-continent (Zealandia) that hosts New Zealand (work with PhD student Alex McCoy-West, who graduated in 2014 and is now a postdoctoral fellow at Durham University) and developing methods to directly date the major tin ore mineral, cassiterite, and isotopically trace the fluids associated with economic tin deposits (PhD student Patrick Carr). Figure 1. 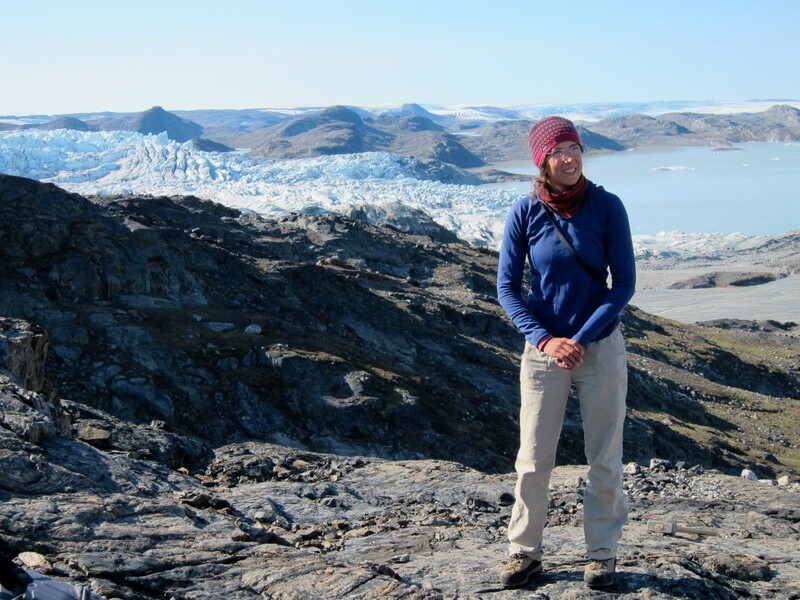 PhD student Laure Gauthiez Putallaz during fieldwork in the early Archean terranes of southwest Greenland. This region contains some of oldest terrestrial rock sequences, with ages as old as 3900 million years, and is a key area for determining mechanisms and processes of early planetary differentiation and early continent formation. The mechanisms of continental crust production and rates of continental growth on the early Earth remain controversial. Related to this are as are the questions rates of the relative roles of early planetary differentiation processes such as accretion, core formation and magma oceans, versus subsequent “normal” tectonic processing in creating Earth’s present day chemical signatures. We address these questions integrating geologic observations with whole rock major, trace element and Sm-Nd isotopic signatures and combined with U-Pb and Lu-Hf isotopic compositions of zircon populations from the same rocks, from the most extensive early rock record comprising the 3.9 Ga to 3.6 Ga terranes of southwest Greenland. These new data reveal repeated patterns of formation of juvenile tonalitic crust and associated mafic and ultramafic rocks in convergent margin settings followed by formation of more evolved granites (Nutman, Bennett and Friend American Journal of Science 313, 877-911; 2013]. Our new zircon Lu-Hf data from rare 3.6-3.7 Ga tonalites within the Itsaq Gneiss Complex, obtained from single component gneisses with simple zircon populations now document continuous extraction of juvenile tonalites from a near chondritic mantle source between 3.9 Ga and 3.6 Ga. In contrast, the more evolved, granitic rocks in each area show slightly negative initial Hf in accord with crustal reworking of the older (3.8-3.9 Ga) gneisses. There is no evidence for Hadean (>4.0 Ga) material in the sources of the granitoids. The Hf isotope-time patterns are consistent with juvenile crust production from a mantle source that experienced only modest amounts of prior crustal extraction. The patterns are distinct from those predicted by reprocessing of an enriched Hadean mafic crust, as has been previously proposed for this region as well as for the source of the Hadean zircons from the Jack Hills, Western Australia. This work shows that plate tectonic processes were operative on the Earth as early as 3.8 billion years ago, but that the amounts of continental crust were small, less than about 15% of the present day mass of continents. Figure 2. Magda Huyskens at work in our SPIDE2R (Sensitive and Precise Isotopic Dating of Earth’s ad Extraterrestrial Rocks) clean laboratory. 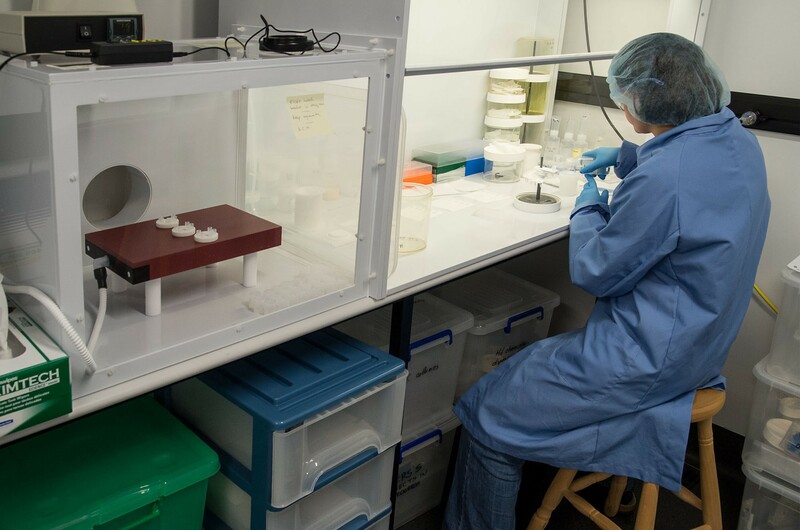 This lab has been specially constructed to enable a range of high precision isotopic analyses of small samples of early Earth, lunar and planetary materials.